Creating a new workplace culture for a new business. Novion Property Group is one of Australia’s leading retail property groups and manages over $14 billion in retail assets. Novion were formerly known as the CFS Retail Property Trust Group (or CFX) after they broke previous ties with Commonwealth Bank and became independent. Novion engaged FutureSpace to create their first workplace on Level 39 of the MLC Centre in the Sydney CBD. As Novion was effectively a new start up company, FutureSpace worked closely with Novion’s senior executives to develop a workplace that reflected the right image and brand for the business. 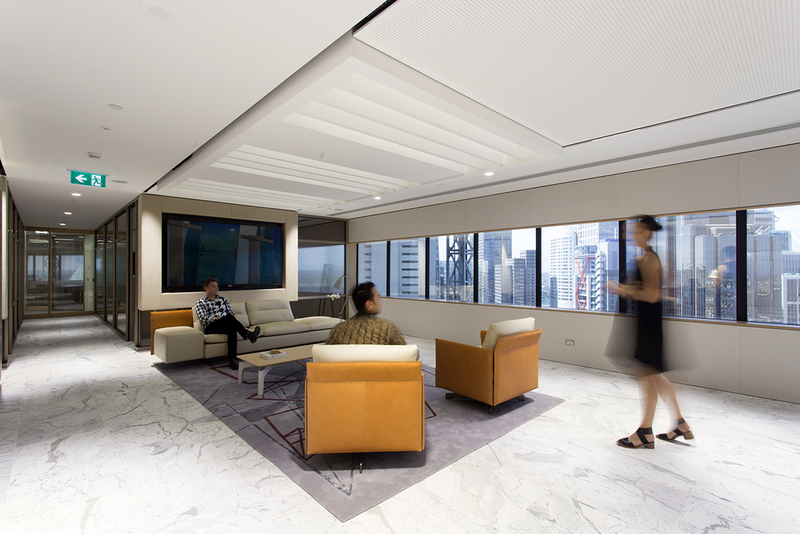 The workplace was designed to reflect the stability and strength of Novion in an iconic Harry Seidler designed building which was undergoing a very significant refurbishment. Novion set a key objective to provide a great workplace for their people and FutureSpace responded with a planning strategy that facilitated everyone’s access to natural light and views. All work areas have standing height meeting areas as a central focus for the teams as well as both enclosed meeting room and open discussion areas. A generous central breakout area supports informal meetings and provides a relaxing informal space for Novion’s people. There are no offices in the new workplace and the most senior executives have a large workstation with an adjacent meeting room. Lighting has been used as an interesting design element with recessed lighting in the reception and boardroom giving the lighting quality of a skylight and work area up lighting from the top of storage elements. A strong yet simple palette of finishes and materials is used in both client and workspace areas to create a distinctive sophisticated environment. In the reception area a custom designed rug references the Robert Owns sculptures in the foyer providing a connection to the architecture of the building.